Now this is a dish I was inspired to prepare since it was a popular lunch dish among most of my co workers when I was in the construction business years ago. When prepared correctly, this is a very tasty dish. My problem was it was inconsistently prepared at different local take-out joints. While some would have a nice tasty sauce and others would have a thick and bland sauce. So after scouring the web for hours I decided to deconstruct this meal and make it tasty and easy to cook for you. Slice beef across the grain into 1/8 inch thick bite-sized pieces. In a bowl mix together soy sauce, honey, fish sauce, red pepper flakes, garlic, and the beef then cover, and let it marinate for 4 hours to overnight in the fridge. Make the sauce while beef is marinating; In a bowl mix and dissolve the cornstarch in soy sauce, dry sherry, sugar, sesame oil, beef broth, and fish sauce. Heat wok and I mean let it heat really good and then add 2 Tbs. of vegetable or canola oil and stir-fry beef for 20 seconds or until it’s no longer pink in small batches, don’t crowd the meat. Repeat this process until all beef is cooked then set aside. Over medium heat stir-fry garlic, dry red pepper flakes , ginger, bell peppers (if using), and onion for 40 seconds. Next add broccoli and carrots, cover, and let simmer for one minute. Increase heat to high, add 1/2 cup beef broth, cover, and let it simmer for another minute. Remove cover, add beef, and all juices accumulated and stir for one minute or until the beef is heated through. Then add the sauce mix and keep stirring until the sauce has thickened. Transfer it to the serving platter. 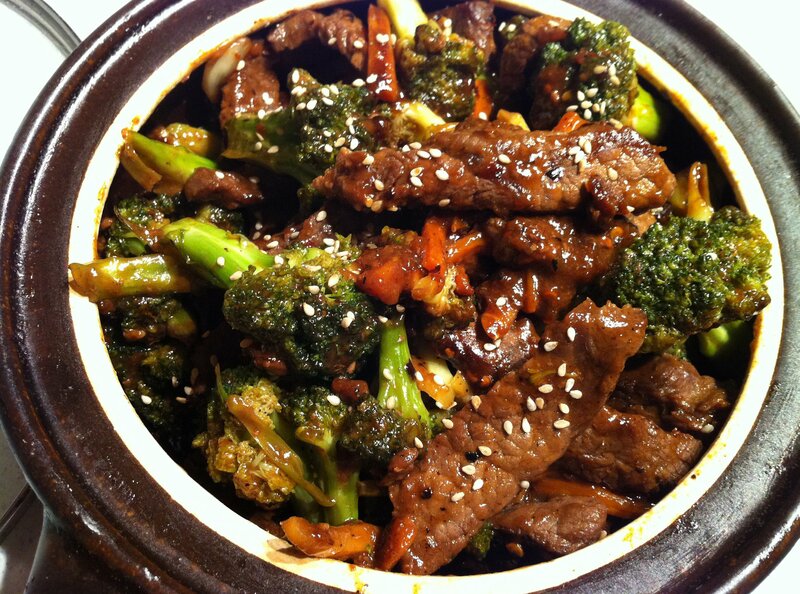 Top white steamed rice with the beef & broccoli. Bon Apetit! Posted on August 15, 2011, in Beef and tagged Flank Steak marinated and stir fried over high heat.. Bookmark the permalink. 2 Comments.